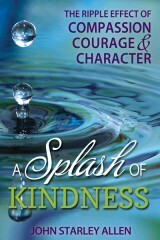 The first chapter of A Splash of Kindness is about my uncle Ronald, the uncle I never knew. When I came upon the following story on the internet I immediately thought of Ronald. And it just reinforced the idea that a life can be short yet still have a profound impact on others. The youngest-ever organ donor in the UK is reportedly a newborn baby who lived for only 100 minutes. According to the BBC, newborn Teddy Houlston’s kidneys and heart valves were donated in the few minutes after his death. His kidneys ended up saving the life of an adult with renal failure. “He lived and died a hero. It’s impossible to explain how proud we are of him,” his father Mike Houlston, from Cardiff, Wales, told the Daily Mirror. Baby Teddy died last year on April 22. However, the news of his organ donation only emerged this week. 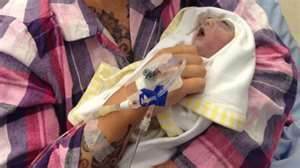 Teddy, a twin, reportedly had anencephaly, a condition in which a baby is born without parts of the brain and skull. His brother, Noah, survived and is a healthy child. Earlier this year, The Telegraph reported that a six-day-old baby girl’s kidneys and liver cells had been donated to two different people after her 2014 death in a London hospital. At the time, she was believed to be the youngest organ donor in the UK. He may have only been alive for a few hours, but Teddy Houlston made a huge impact. Teddy Houlston may have only been alive for 100 minutes, but he’s still impacting lives today. Jess and Mike Houlston of the United Kingdom were expecting twins when Jess was told 12 weeks into her pregnancy that Teddy, one of the babies, was terminally ill. Teddy had anencephaly, a condition that prevents the skull and brain from developing normally. Teddy was expected to either die in the womb or shortly after childbirth, according to ABC News. “When we found out he wasn’t going to survive, it was obviously crushing, soul-destroying,” Jess said in a video for the Cardiff and Vale University Health Board. Faced with the devastating news, Jess and Mike decided not to terminate the pregnancy, but to go ahead with the birth and hope that Teddy’s organs could be donated. “It was helping us that he could go on and live through someone else,” Jess said. “It was the only positive thing that could have come out of here.”. Teddy and his brother Noah were born on April 22, 2014. The family was able to bond with Teddy before he passed away after a few hours. Teddy ended up making a big impact in his short life. His kidneys were transplanted into an adult recipient, saving that person’s life, according to the National Health Service. That officially made Teddy the youngest organ donor ever in the U.K., according to the BBC. Now, the family hopes on what would have been Teddy’s first birthday, that their child’s story will encourage others to sign up as an organ donor.